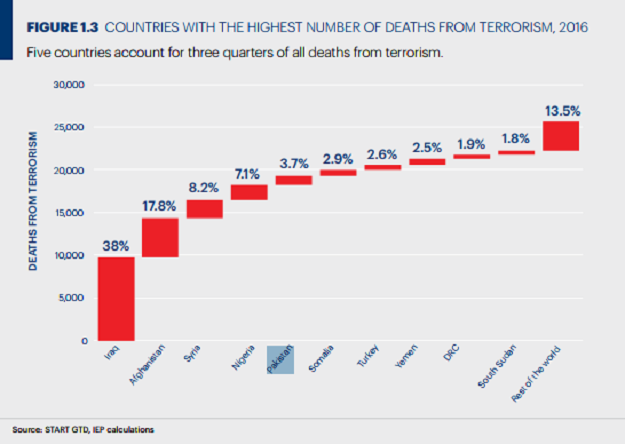 Global Terror Deaths Down But Jihadist Threat Levels Increase For ME & Africa - 2019 Is The Battle of Hearts and Minds. Recorded deaths from terrorist attacks may have reduced globally in 2017 according to the newly released 2018 Global Terrorism Index (GTI) report but terrorism and insurgency groups are becoming more organised, coordinated and focusing on winning hearts and minds of the local population than ever before. The Middle East and Africa remain the most vulnerable and unstable region in the world as a coalition of ISIS and Al-Qaeda Jihadist groups linked to organised criminal networks are becoming more strategic, choosing to focus less on number of attacks and more on the significance and long term impact of targets. The 2018 GTI report should not be misconstrued as an indicator of reduced terrorism threats globally but rather a jihadist change of strategy, challenges in recording death from terrorist attacks , selective media reporting and global terrorism fatigue. The 2018 GTI report by the Institute for Economics and Peace has recorded a 27% decrease in death from terrorist attacks in 2017 compared to 2016. It also cites a reduction from 79 to 77 countries where someone died as a result of a terrorist incident. Attacks and deaths as a result of terrorism in Syria, Iraq and Europe dropped significantly since 2016. 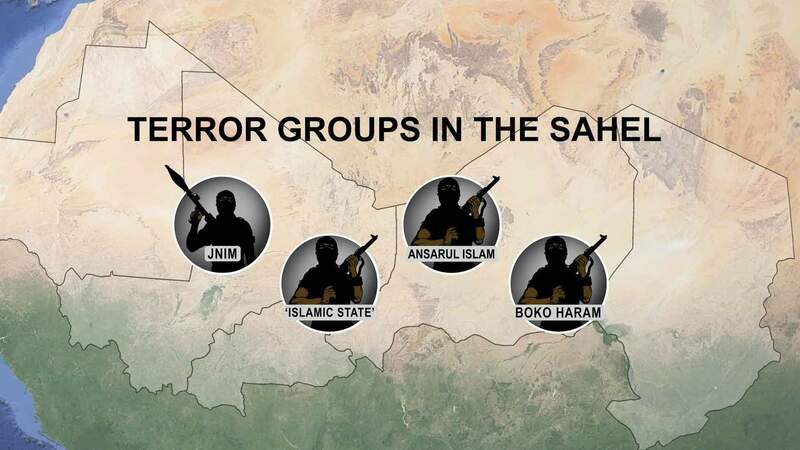 North, Central, Sub Saharan Africa and the Sahel where Boko Haram factions , Al-Shabaab and AQIM linked jihadist groups operate recorded more attacks and more casualties than anywhere else in the world . Taking into context attack patterns in 2018 , what explains the 2017 drop in the number of terror related death and has Africa become a fertile ground for Global Jihadist to settle after the fall of Raqqa and Mosul? The level and nature of attacks leading to mass casualties may have dropped in Iraq and Syria after the slow but steady collapse of ISIS strongholds in Raqqa and Mosul between 2016 & 2017. The eventual collapse led to a balloon effect in parts of Middle East and Africa particularly in Libya, Egypt, Afghanistan, Mali, Northern Nigeria and Somalia by Boko Haram ISIS faction (Islamic State of West Africa Province – ISWAP) AQIM and Al-Shabaab Al-Qaeda branch. The demise of Mosul and Raqqa did not lead to the disappearance of surviving ISIS fighters into thin air – the leadership negotiated its way out of the ruins, moving its remaining fighters across Turkey, Libya, Lake Chad and the Sahel region. The transitional gap of moving hundreds of men and resources to link up with other ISIS networks like ISWAP , time required for new arrivals to understand the theatre of operation , may account for some reduced terrorist activities and deaths immediately after the collapse of Raqqa and Mosul in 2017. Compared to current activities in 2018, the balloon effect has its greatest impact in the Lake Chad Basin and the Sahel where experienced foreign fighters Returnees have joined ranks with ISWAP and other existing AQ and Al-Shabaab networks. These African based Jihadist groups are benefiting from the experience and capacity of these foreign fighter returnees (FFRs) and they are taking the battle to the military and other hard targets. No doubt the GTI reports rates Nigeria, Somalia, Libya, Congo DRC , Rep of Congo , Central Africa Republic, Cameroon, Mauritania, Niger, Chad, Mali, Kenya … low and very low score in peace and stability for 2017 thanks to the displacement effect of the collapse of Raqqa and Mosul. What accounts for reduced attacks and deaths in Europe in 2017. Again the effect of the gradual collapse of Raqqa and Mosul forced ISIS leadership which directed and claimed most of the attacks on European soil to focus on re-strategizing and seeking alternative territory to flee Syria and Iraq. Equally key was an increase in security spending and community vigilance efforts within Europe following random truck, knife and gun attacks on soft targets. Most European governments including the UK introduced more proactive measures and increased spending and human resources towards anti terrorism and counter terrorism activities. This measures led to reduced vulnerability of public places and preferred terrorist high value targets. The more difficult the target, the less attractive it is to a terrorist, hence less casualties. For Example, the UK and most countries in Europe have promoted community awareness activities on social media, newspapers and mainstream media platforms – visible adverts in popular spots like’ see something say something ‘ , how to spot and report suspicious activities and video adverts on what to do when faced with a terrorist gun , knife or van attack may have played a real and psychological deterrence effect on potential terrorist attacks but also increased population knowledge and confidence to recognise and report suspicious activities. Terrorist rely on the element of surprise and they would avoid selecting hard targets or anyone with a high survival skill knowledge. 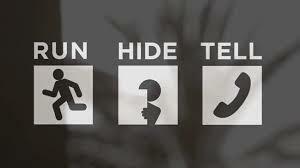 Catchy adverts like ‘ when to Run – Hide, fight and Tell ‘ worked against amateur terrorist. Are this 2017 figures realistic? The report acknowledges blind spots. In remote areas in Asia, Middle East, Sub Sahara Africa, Lake Chad Basin where ISIS and Al-Qaeda affiliated groups and others operate – ADF in Congo DRC & Uganda , Boko Haram factions , Al-Shabaab – daily small scale or attacks on individuals that result in casualties are hugely under reported. In some cases this is down to limited or no access to Internet or mainstream media. When terrorist attacks however large or small scale occur beyond major cities like London, Paris or New York , or do not happen in or have a direct impact on Western interest and victims, these attacks and casualties do not make it to the media or are simply ignored as not media worthy. These small and remote numbers are missed by a large margin especially in situations where less simultaneous Jihadist attacks occur against Western and mainstream media news-worthy targets. The real number of casualties from security service men and women is still a reporting taboo shrouded in ‘classified documents’. Official reporting of casualties from military and security personnel is the most under reported when a terrorist attack occurs especially in Africa and the Middle East. The story goes that it is always the terrorist that gets killed in their numbers and not the military or other service men and women. This underreporting or hiding of real casualty numbers of service men and women is a strategy applied by most states in the Middle East and Africa to avoid creating panic amongst service men and women in and outside battle field. There is the need to maintain fighting moral, avoid negative reactions from the population and family or friends of the fallen. Above all, not reporting the real number of service men and women casualties is done for propaganda against enemy fighters. The natural military tactics of ‘ when you are strong , show you’re weak and when you’re weak , show you’re strong’ kicks in automatically. These hidden figures could make a difference to the real death toll recorded in the GTI report. Winning Hearts and Minds: Have Jihadist groups Changed Strategy? Every successful battle, especially one that is asymmetric in nature depends largely on the support and trust of the local population that each side depends on to either get intelligence, hide their activities or get moral support. Intelligence is the key and security services as well as jihadist groups understand the need to win the hearts and minds of the local population to survive and sustain their activities. The focus on winning hearts and minds by ISIS linked Jihadist groups has resulted in a change of attack tactics within the past two years. ISIS and Al-Qaeda linked Jihadist groups are now focusing on a long term strategy of winning hearts and minds. They avoid attacking the local population or claim attacks that kill innocent people to avoid loosing face. Hence a reduced and deliberate tactics by these groups to avoid carrying out attacks that have the potential to kill innocent civilians. Lessons from the collapse of Raqqa and Mosul indicate that Jihadist groups are focusing on long term strategic planning and limit attacks on soft civilian targets so as to win the battle of hearts and minds necessary to realise their perceived goal of a Caliphate. They focus their attacks on sensitive government infrastructures rather than busy markets , shopping malls , Mosque where innocent civilians are likely to be the highest casualties. But this tactics can change in 2019 if Jihadist groups become more desperate. Deaths from Terrorist attacks may have fallen in Europe, Syria and Iraq in 2017 but ISIS coordinated, inspired and directed attacks increased in Africa and the Middle East due to the ISIS displacement effect. The jihadist key players like ISIS and Al-Qaeda May have gone quiet in Europe in terms of their attacks and casualty level but these groups are certainly not silent in other areas of the world especially Africa. In the long war against global jihadist groups, the number of attacks should not be mistaken for a low threat level. A more globally coordinated effort beyond words is required to reduce to the bear minimum the threats that these jihadist pose to global peace and security particularly in Africa and the Middle East which seem to represent the weakest link in efforts to tackle ISIS and Al-Qaeda growing influence. David Otto is the CT Director of TGS Intelligence Consultants Ltd and the Preventing Radicalisation and Violent Extremism Programme – Step In Step Out (SISO) based in the United Kingdom. He is also Senior Counter Terrorism Advisor for Global Risk International. David’s Work focuses on designing and implementing sustainable Anti Terrorism, Counter Terrorism and Organised Crime solutions to prevent and respond to vulnerabilities, political Instability, insurgencies and Organised Crime – between the geographical boundaries of the West and Africa. Under TGS Prevent initiative – SISO – David Otto was instrumental in organising the first ever African focused Counter Terrorism awareness conference in London (26th May 2015) in collaboration with the University of East London on the topic – ‘RADICALISATION. He is frequently invited by NGOs including the UN, NATO, Interpol as a frontline practitioner and academic to share his knowledge and experience on government community resilience strategies in Europe, Asia and Africa, especially on national proactive intervention initiatives within local communities, national security sectors and prison settings. He is regularly invited and quoted by key news channels Aljazeera, BBC News, Arise TV, BEN TV, PRESS TV, VOX Africa, Channel TV, and AILTV …as an expert to share his opinion on security and Counter Terrorism from an African and western link perspective. His work has been published, and features in international newspapers, social media – IBTIMES,CNN Awake Africa, Africa Voices etc. David holds a BA (Hons) in Law and Criminology; Master of Science (MSc) in Counter Terrorism and Organised Crime; Diploma IMIS -Information Technology 1 and 2; Micro-computer and Network Systems; and Business Communication. David Otto is a Certified Anti-Terrorism Specialist (CAS) & Certified Master Anti-Terrorism Specialist (CMAS) with the Anti-Terrorism Association Board. He is also a Certified Level 2 Prevent and Safeguarding Trainer.